That’s what the fish oil industry is worth each year in the US alone. 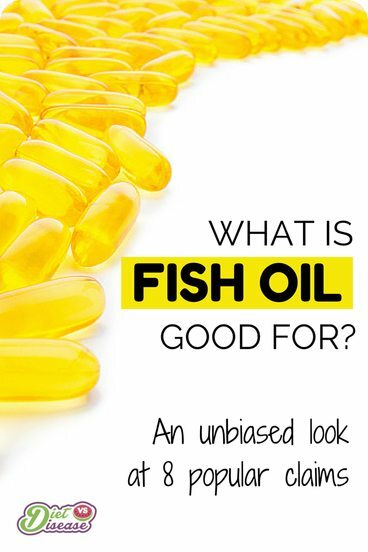 But what is fish oil good for when it comes to chronic disease, skin conditions and weight loss? Are the reported health benefits true… or have they been oversold to us like most other “healthy” foods and supplements? 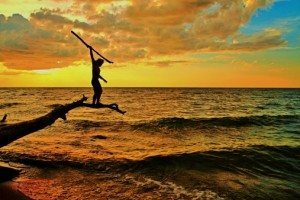 This article looks at 8 of the most popular claims to uncover the truth. How much fish oil should I take per day? Fish oil supplements are made from fats (oils) of fatty fish species like salmon, sardines and mackerel. The fats in these fish are mostly omega-3 fats, which play a vital role in brain function, cell growth and inflammation. These fats cannot be made by our bodies, so it’s essential we get them from food. Fish oil pills and liquids are a concentrated source of these healthy omega-3 fats, specifically EPA (Eicosapentaenoic acid) and DHA (Docosahexaenoic acid). EPA and DHA are able to influence our health primarily through signalling compounds, known as eicosanoids. These compounds are produced in response to cellular stress and help combat harmful inflammation. Long term stress and inflammation is a driver behind many of today’s physical and mental health burdens, which is why the benefits of fish oil pills are so widespread. Summary: Fish oil is a concentrated source of healthy omega-3 fats, which play a vital role in our brain function and inflammation. It works by helping to relieve stress and harmful inflammation that occurs in our cells. Depression is now one of the most common mental disorders in the world. An estimated 16 million US adults experienced at least one major depressive episode in 2012. A large review of 28 previous studies found that in most cases fish oil, particularly EPA, was helpful in treating depressive symptoms. 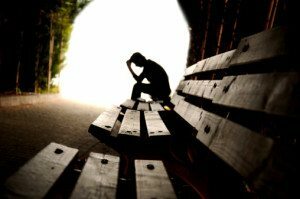 It appears to be much more effective in those with severe depression vs those with low depressive symptoms (1). The majority of study participants with severe depression were also being treated with standard anti-depressant medication. This suggests that fish oil could improve the effectiveness of conventional therapy. In fact, treatment response rates increased up to a whopping 30% using combination therapy (2). 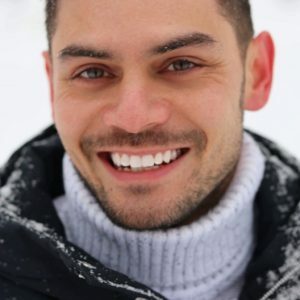 There is also evidence indicating fish oil can benefit other mental health issues including bipolar disorder and dementia, but more studies are needed before making recommendations (3, 4). 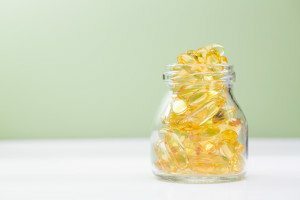 Summary: Using fish oil in combination with conventional medication has been shown to greatly reduce depressive symptoms, especially in those with severe depression. 1 in 3 US adults has high blood pressure, and it is responsible for 1,000 deaths per day in America alone. That’s why correcting high blood pressure is one of, if not the most important thing you can do to improve your health and lifespan. Fish oil pills are one of many natural foods shown to effectively treat high blood pressure (5). The mechanism of effect is still unclear, although there is good reason to believe it’s related to the Omega-6: Omega-3 ratio. It’s thought that the more omega-3 fats in your diet compared to omega-6 fats, the better for your cardiovascular health. The ideal ratio is 1:1, however today’s average diet has a ratio of around 16:1. Put another way, we only consume 1 gram of omega-3 fats for every 16 grams of omega-6 fats (6, 7). Fish oil provides an affordable and convenient way to improve this ratio, which likely improves blood pressure as a result. If you’re interested, there are even better ways to lower your blood pressure quickly, without medication. Summary: Research shows that fish oil is an effective treatment for high blood pressure. It is thought to help by improving our Omega-6: Omega-3 ratio. Elevated blood triglyceride levels is a major risk factor for heart disease. This is a known fact and is not disputed like Total or LDL cholesterol. Research shows that both EPA and DHA in fish oil reliably help to reduce triglycerides in those with elevated levels, sometimes by as much as 20% (8). These affects are only seen in long-term supplementation and doses of around 4 grams of fish oil per day, so consistency is key. 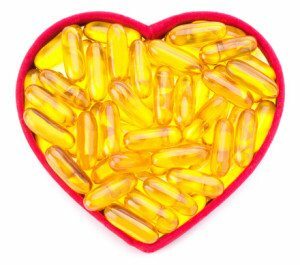 Fish oil also appears to notably increase HDL and LDL levels, which are cholesterol markers of heart health. An increase in HDL is good, however an increase in LDL is undesirable, particularly in those who already have elevated LDL. If you take a cholesterol lowering drug or your doctor deems lower triglyceride levels as the most important factor, there are benefits from using fish oil pills. But if your LDL is elevated and difficult to control then you should speak with your doctor before making changes. Summary: Regular fish oil supplementation can lower triglycerides by up to 20% in individuals with elevated levels. It can also increase HDL levels but in tandem with increased LDL levels. If you have raised LDL levels you should consult with your doctor first. 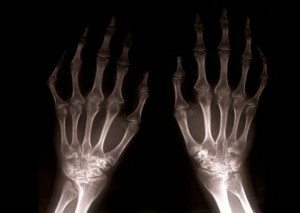 Arthritis is a form of inflammatory joint disease that tends to occur as we grow older. 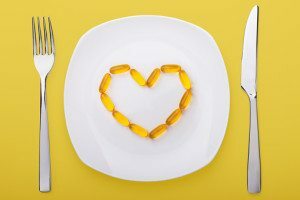 Given the anti-inflammatory properties of omega-3 fats, many fish oil supplement brands claim they can prevent or alleviate inflammatory symptoms associated with osteoarthritis and rheumatoid arthritis. Limited animal and human trials have found benefits, largely seen when consuming more omega-3 fats (from fish oil or krill oil) in place of omega-6 fats (9, 10, 11, 12). Additionally, a high seafood intake is continually linked to a lower risk of fractures in the elderly, which suggests fish oil may be protective of bone health (13, 14). Theoretically fish oil could be directly responsible for these effects, however we can’t say for sure until more long-term human trials are undertaken. Summary: It is thought the anti-inflammatory properties of fish oil are beneficial for treating osteoarthritis and rheumatoid arthritis, however the evidence is not solid. Attention deficit-hyperactivity disorder (ADHD) is the most common neuro-developmental disorder in childhood. 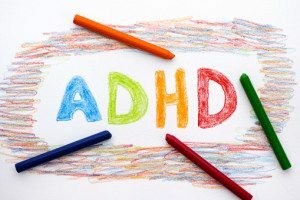 Those with ADHD appear to have deficits in maturation of the frontal lobe and circuits connecting with other parts of the brain involved in regulating behaviour. So what does fish oil do to help? The omega-3 fats in fish oil are thought to play a key role in the early development of these circuits, which is why an insufficiency is quite possibly a risk factor for ADHD and other psychiatric disorders (15). Researchers analysed ten previous studies involving 699 children and found that fish oil is usually effective in ADHD treatment, particularly varieties rich in EPA (16). The impact is modest compared to psychostimulants and other regular medications like Adderall, but appear useful when taken alongside those conventional treatments. Given there are little to no side-effects of fish oil use, it makes sense to try them out. Interestingly, plant-based omega-3 supplements appear to have no effect on ADHD symptoms (17). Summary: Studies show the benefits of fish oil pills, particularly those high in EPA, extend to ADHD treatment in children. It seems most effective when used alongside conventional medication. Due to the important link between omega-3 fats (specifically DHA) and brain development, adequate intake during pregnancy is crucial for the fetus. The problem is that most fish species are also rich in the mineral mercury. Excessive mercury exposure during pregnancy – among other things – is linked with both pregnancy complications and developmental issues in infants (18). Fortunately most fish oil pills and liquids are considered a safe, mercury-free source of DHA for expecting mothers. Pregnant women should go for at least 200 mg of DHA daily. Just be sure to look for labels that confirm the product is low in mercury. Summary: Mercury is thought to be harmful for the child when pregnant. Regular fatty fish species are rich in mercury, whereas most brands of fish oil are not. This makes fish oil a good alternative during pregnancy. Acne is a complex inflammatory skin condition that is much more common in Westernised societies than others (19). Many experts believe this is due to the low omega-3 intake (and perhaps high omega-6 intake) of most Western diets. Omega-3 fats are said to inhibit mediators responsible for most inflammatory acne lesions (pimples) (20). This could be why a greater fish intake is associated with a protective effect against moderate acne (21, 22). But does that mean fish oil is good for your skin? The one trial looking at the effects of fish oil and acne contained only 13 subjects. After twelve weeks, there was no significant improvements seen with fish oil treatment (930 mg EPA). Eight subjects saw improvements, yet four subjects got worse (23). There is no doubt that diet influences acne occurrence and severity, but the reported benefits of fish oil pills needs to be studied further. Summary: In theory omega-3 fats like fish oil could help treat acne, but current research shows no consistent improvements. Low-grade inflammation drives many of today’s metabolic health issues, including insulin resistance and obesity to some extent (24, 25). Given the anti-inflammatory effects of fish oil, some researchers have proposed it may positively influence fat metabolism and therefore fat loss as well. 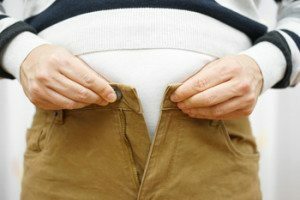 But studies on obese individuals have found it has little to no direct positive influences on weight management. Its effects seem to be completely dependent on other weight loss interventions like exercise and reducing calories (26, 27, 28, 29, 30). In other words, fish oil may help slightly if you are also eating fewer calories and exercising regularly, but it does not have an inherent weight loss effect on its own. You may be better off considering the probiotic Lactobacillus gasseri. Summary: The benefits fish oil has on weight loss only occur with caloric restriction or increased exercise. It has barely any notable weight loss effect on its own. Optimal fish oil dosage depends on your reason for use. For general health improvements, at least 1 gram per day is recommended, but I’d go for at least 2 grams. Most fish oil pills are 1-2 grams per pill anyways. If you plan on taking more than 3 grams per day, consult with your doctor first. Note that these doses refer to total fish oil, which is a combination of both EPA and DHA. The product label states how much of each omega-3 fat is contained within the pill itself. If your goal of supplementation is to lower blood pressure or triglycerides, then 2-3 grams of (total) fish oil per day is recommended. For depressive symptoms, a fish oil supplement with at least 1000 mg of EPA appears most effective, while for ADHD it should contain at least 450 mg of EPA. You can take fish oil pills at any time of the day, but it’s best with meals in order to minimise bloating and “fish burps”. Summary: Take 1-2 grams per day for general health, but don’t go over 3 grams without asking your doctor first. For depression and ADHD, choose fish oil doses that contain at least 1000 mg and 450 mg of EPA, respectively. Even if it can’t live up to all the hype, it’s pretty clear what fish oil is good for and why it’s so popular. There is strong evidence supporting its benefits on cardiovascular and mental health conditions, with little to no side-effects or risks. 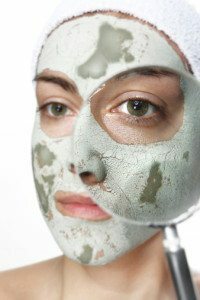 The same cannot be said for weight loss and acne, however, with very underwhelming results. For those who don’t consume fatty fish regularly, fish oil will very likely improve your health, especially into old age. It’s easily the most inexpensive and safest way to meet your omega-3 requirements too. DHA is left out in the last sentence, the summary, so “respectively” doesn’t tell me how much of each one. Respectively means 1000mg EPA for depression, 450mg EPA for ADHD. DHA does not appear as important for those conditions. What brands of fish oil supplements would you recommend? I know there are many out there that are not reputable. That’s a good question I should put it in the post. Honestly I would go with a name brand at the pharmacy that you recognise. Online is a bit more “wild west” even though it’s cheaper. Otherwise products on amazon with loads of good reviews is normally a good indicator (but theres always exceptions of course). Otherwise I don’t have a specific brand to recommend, sorry!